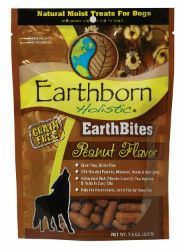 These treats contain real roasted peanuts for a flavor to savor. Your dog can enjoy these grain-free vegetarian treats while still maintaining a healthy lifestyle. Formulated with peas, apples, blueberries, carrots and spinach, wholesome vegetables and fruits are in every bite. Optimal palatability and nutritional benefits are sure to make this formula a favorite.